The turmoil in global markets over the fourth quarter of 2018 had a tangible impact on debt origination volumes for the seasonally slow period, with companies around the globe being reluctant to raise fresh debt capital. 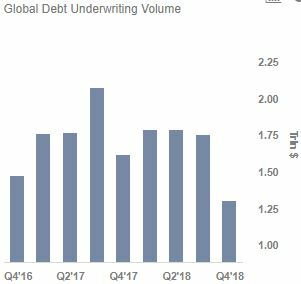 This resulted in total debt origination volumes falling to just $1.3 trillion for Q4 2018, according to quarterly data published by Thomson Reuters. This compares to total debt capital deal volumes of $1.62 trillion in the last quarter of 2017, and $1.76 trillion for the previous quarter. Notably, the decline in debt activity wasn’t seen across global regions. While deal volumes in the U.S. and EMEA slumped 24% sequentially, there was an 11% increase in international emerging market debt volumes. This includes a nearly 100% increase in debt origination volumes in emerging EMEA nations, a 54% increase in emerging Latin American nations and a 5% increase in Asia-Pacific region. This overall trend had the most notable impact on German banking giant Deutsche Bank (NYSE:DB), which saw its market share for Q4 2018 shrink to 2.7% from 3.2% a year ago. In fact, Deutsche Bank’s ongoing struggle over recent years to improve profitability and put its legacy issues to rest has resulted in its share of the global debt origination industry shrinking from nearly 7% over 2011-13 to just 3% for full-year 2018. The total number of global debt origination fell from 5,605 in Q3 2018 and 5,734 in Q4 2017, to 4,581 in Q4 2018 – the lowest figure since the unusually slow Q1 2017. As the total debt origination volume fell by a smaller percentage compared to the number of deals year-on-year, the average deal size for Q4 2018 nudged slightly higher to $284 million from $282 million in Q4 2017. However, as larger debt origination deals generate lower fees per dollar raised compared to smaller deals, the overall higher average deal figure – coupled with the notable reduction in total deal volume and number of deals – translated into a sharp reduction in debt origination fees across investment banks. 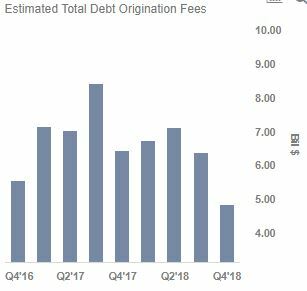 Thomson Reuters estimates that total debt origination fees fell from roughly $6.4 billion in Q4 2017 as well as Q3 2018, to just $4.8 billion in Q4 2018. This represents a sharp 25% reduction in these fees across the industry. Notably, Deutsche Bank’s imputed fee figure is expected to be just $114 million for Q4 2018. This is less than half the average figure of $238 million for the bank in the previous seven quarters, and can be attributed to a combination of industry-wide as well as company-specific headwinds. More specifically, the bank has had a hard time over recent years reining in costs even as less-than-desirable economic conditions in its core market of Europe weigh on its top line. We will capture the changes in market share for the five largest U.S. and European investment banks over recent quarters in a follow-up article, along with details of the expected increase/decrease in debt origination fees for each of these banks year-on-year and sequentially.